Long a Southern classic, chicken and waffles pop up in restaurants around New York City. Harlem may have been the original Gotham landing spot for soul-food icon chicken and waffles, but the dish is on the move throughout New York City. In always-on-trend Williamsburg, the aptly named Sweet Chick (164 Bedford Ave at North 8th St, Williamsburg, Brooklyn; 347-725-4793, sweetchicknyc.com), which debuted in February, makes the sweet-savory union its headlining specialty: succulent, crisp-skinned chicken on fluffy Belgian waffles ($16). 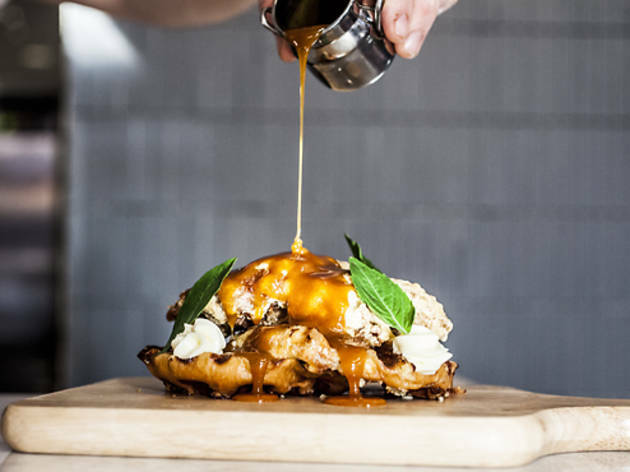 Purists should stick with the traditional rendition, but you can add a twist to your order with flavored waffles (bacon and cheddar, rosemary and mushrooms) and butters (cranberry, herb, lemon-honey). Also in the neighborhood, Hope Garage (163 Hope St between Keap St and Union Ave, Williamsburg, Brooklyn; 718-388-4626, hopegarage.com) makes a straightforward version, placing three crunchy chicken strips on a yeasty round waffle, with hot sauce and fragrant cinnamon-maple butter (brunch only, $14). But other restaurants are taking creative license. 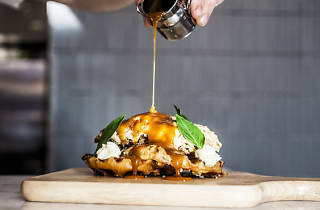 At newly opened American gastropub Distilled (211 West Broadway at Franklin St; 212-601-9514, distilledny.com), chef Shane Lyons tweaks the formula with upmarket ingredients: duck confit, pressed brioche and smoked-serrano maple syrup ($20). In the brunch-only plate at Rogue & Canon (128 W Houston St at Sullivan St; 646-398-8700, rogueandcanon.com), golden-crusted breast meat is sandwiched in a sliced Belgian waffle for a handheld adaptation ($16). Piri piri–infused butter, inspired by a Portuguese hot sauce, balances out a maple-sweetened slaw of cabbage and carrots. Ramen shop Dassara (271 Smith St between DeGraw and Sackett Sts, Carroll Gardens, Brooklyn; 718-643-0781, dassara.com) also offers a cross-cultural take—juicy chunks of twice-fried chicken are tossed in a garlicky soy-and-mirin sauce, paired with a pineapple-coconut waffle and drizzled with salted caramel (brunch only, $11). And don’t be surprised to see the dynamic duo popping up on more menus soon—Amy Ruth’s, you’ve got some competition.